Today, it is common to see remakes, remastered and re-imaginings of games that can make the leap from the previous generation to the current, or rise from the ashes and return of past consoles. Not as usual, though, see a revival in which the main change is a change of camera. What could be a simple patch, or at most a downloadable, becomes an independent capacity, called How to Survive: Third Person Standalone. 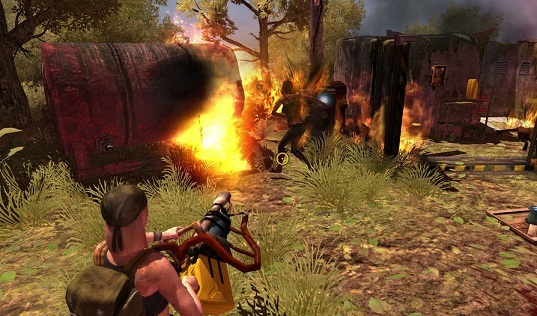 After How to Survive: Storm Warning Edition, released on Xbox One and PlayStation 4, this title released a couple of years ago on Xbox 360 and PC, and then on PlayStation 3 and Wii U. In case you already know the game, I anticipate that this is basically a change of camera and multiplayer loss. How to Survive: Storm Warning Edition was originally a mix of dungeon crawler and twin-stick shooter, but with an emphasis component of survival. Now, it is passed to the "third person", which is actually closer camera as the original game on an overhead perspective, for practical purposes, no longer another camera in third person. The concept gains a little more action from this perspective, but really they are the feelings, as the gameplay remains virtually unchanged in the control scheme, much like most third-person shooters with a camera behind the character. Moreover, as we told you, we will go more or less labyrinthine scenarios destroying enemies that come our way as we survive, we must not forget this. All pillars are maintained, and as explained previously, the enemies will not be the only problem, and should be monitored our physiological, such as thirst, hunger, sleep or fatigue needs. Neglecting them will not end with our health, but it will have a negative effect on our skills, which eventually becomes an inferiority that will determine our progress. About the original title (we reviewed the latest version here), commenting once again that all the characters have their different-force statistics, energy, health and precision, and consistent, each will best suit a style of play. This fits through as we progress through their gamer, we gain experience and we can invest in improving our skills. It is not really that the original as we said before. Indeed, change is pleasant we think it looks good, making it a more immersive experience, and even holding visually quite well considering its base.. How to Survive: Third Person Standalone still works with the nearby chamber, sometimes even better from aerial perspective, but also in other aspects more failure. The fighting, especially when aiming, seems to us coarser. Don’t forget that at the base drink a lot of dungeon crawlers, and adapt to more characteristic controls an action game leaves much room for improvement. Moreover, its visuals alternating light and shadow. On the one hand, we are appreciated details like background blur stating, getting a very attractive effect, and sometimes animations reminiscent of the days of the 32/64 bits. Almost everything in this release are opposing feelings, is that we feel that to sell it as a standalone game would have a lot more work on the part of developers, since good intentions are glimpsed occasionally collide with more typical of a mod simple fact in a couple of days by the community. How to Survive, the original will cost about 3 euros, so if we want to rediscover the game can be an interesting option, but our experience has not been entirely satisfactory. How to Survive: Third Person Standalone won several things, but we also lose many others, and one of those is the cooperative, which for us is a major loss. Now, we also want to make clear How to Survive: Third Person Standalone works with your nearest camera, offers a different experience and sometimes it seems even a new game, but control seems to us somewhat crude, and often knows more than a mod Game sold separately, despite, they offer a significant discount for the originally holders. How to Survive: Third Person Standalone for a user can be problems for another and vice versa, so we encourage you to understand well what it offers and choose accordingly.